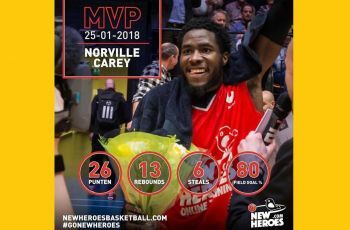 Carey, who brought the crowd to its feet with the execution of an alley-oop in the win against Number 2 ranked Zorg en Zekerheid Leiden on Sunday January 21, 2018, had 26 points, 13 rebounds and 6 steals as New Heroes won 89-64 at de Maaspoort in Venlo on Thursday January 25, 2018. The towering Virgin Islander played 29:16 for his game high score, which earned him MVP status. Mike Miklusak supported Carey with 21 points and 8 rebounds and Stefan Wessels, 14 points. For Apollo, Berend Weijs had 17 points and Max van Schaik 13 points and 7 rebounds. Number 3 ranked New Heroes’ winning streak includes victory over BC Apollo Amsterdam, Zorg en Zekerheid Leiden, Aris Leeuwarden and Forward Lease Rotterdam. Always continue to do and be your very best. Proud of you son. Be bless. Be brave. Be safe. Congratulations bro. You did yourself and you’re community proud. Thanks for setting an example for all those who think and feel we can’t don something meaningful and fun with our lives. Many won’t know but a lot of baseball league in Europe is bigger than (NBA)- we’re just on the western side of the world. I only asked that you keep and first and all will be well. The Sky ain’t the limit-it’s just the view. Don't forget that Fahie was the one that opened the door for these young men to go to the US and display their talent while getting an education. growing up. Also proud of being your first coach(not basketball). Great job Carey. Very proud of you.